As the cost to acquire mobile users continues to rise, developers are starting to evaluate the quality of users they acquire via paid campaigns. 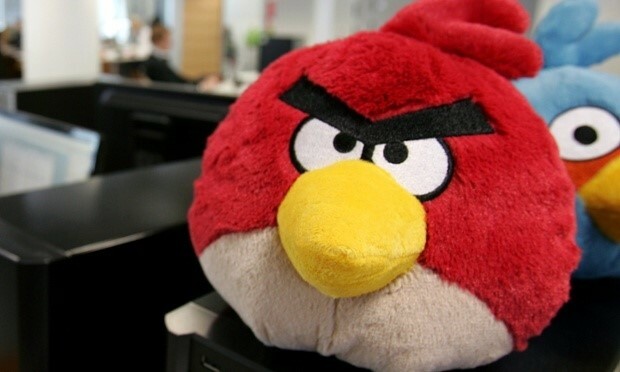 Developers need to reach the right mobile users: those who will engage with an app and become loyal over the long term. To help developers reach new users, we are excited to announce the launch of Advertise Your App with Amazon! This advertising platform is exclusively available to Amazon mobile app developers. It’s simple, fast, and effective. Promote your app to millions of users on Fire tablet wakescreens and mobile placements on the Amazon Mobile Ad Network. According to Newzoo, gamers using the Amazon Appstore are the most likely to spend money. More specifically, 64% of mobile gamers that use the Amazon Appstore spend money on mobile games, versus 37% for Google Play. Amazon users are more likely to engage with your app and spend money, and Advertise Your App enables you to target new customers while driving the installs you need to grow your business. When you launch an Advertise Your App campaign, your app can be merchandized on Fire tablet wakescreens and mobile placements on the Amazon Mobile Ad Network, enabling you to directly reach Android and Fire users. Click here to learn more about Advertise Your App. Today, Amazon is happy to announce that Appstore developers can now integrate the AppLovin SDK and start monetizing their Amazon apps with ads from Applovin. According to Applovin, they process over 30 billion advertisement requests a day and use real-time feedback to make effective marketing decisions across 1 billion mobile consumers worldwide - delivering results for publishers like Disney, Uber, Groupon, CBS, Hotels.com, Yelp, Zynga, and King.com and others. Because the AppLovin platform optimizes advertiser campaigns for ROI, advertisers see a higher return on their ad spend and are willing to pay for the quality placements they receive. By providing top quality ad placements, with the hundreds of top brands they work with, they can then serve ads at a massive scale, thereby maximizing developers’ earnings. Moreover, with AppLovin, developers get paid quickly -- just 15 days after month-end. AppLovin offers all ad formats (native, video/graphic interstitial, and rewarded video) to allow developers to optimize the ad format type for the best user experience and increased monetization. AppLovin has grown its business fast with a focus on a strong product and a quality service. The company offers ad creative services in-house, and a fully managed service for advertisers. This means advertisers reap the benefits of creative and account optimization working together, and that the service can manage down-funnel goals that are focused on ROI. Sign-up is fast and takes less than a minute. Just go to the AppLovin sign up page, and make sure to note that you are a developer in the sign-up field. Once sign up is completed, approval is immediate -- you’ll receive a welcome email. Then simply click “login” on the AppLovin site to login, and from there integrate the AppLovin SDK (https://applovin.com/index#fireosIntegration) and get any additional support you might need. The Game Developers Conference (GDC) is the largest annual gathering of professional video game developers providing a place for the industry to collaborate, network and share best practices for creating compelling game experiences. 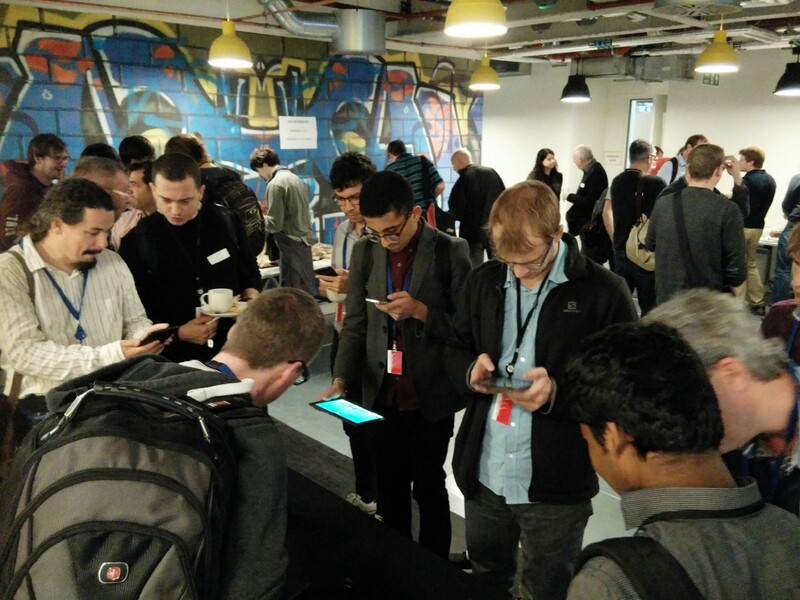 This year Amazon hosted a full Developer Day with sessions that covered building Android games for our full line of devices, Amazon Echo, Fire Tablets, Fire TV and Fire Phone, how to build better cloud gaming experiences, reaching fans with Twitch, and applying in-app monetization best practices based on Amazon's IAP data. These sessions were previously only available to GDC attendees, and we’re excited to announce that we’ve made all of the Amazon GDC Developer Day sessions freely available online. Enjoy! An overview of Amazon's current developer ecosystem. Learn how you can take advantage of AWS services specifically targeted for Game Developers, Amazon's Appstore and the new line of consumer Fire devices like Amazon Echo, Amazon Fire TV, Fire TV Stick and Fire tablets, as well as monetization services such as in-app purchasing. Plus, hear how G5 entertainment has had success on the Amazon platform from G5 CEO Vlad Suglobov. In this talk, we cover important tips for porting Unity games over to Fire TV, Fire tablets and Fire phone. Through code examples, we'll demo how to support multiple resolutions for pixel perfect Orthographic and Perspective Cameras, abstracting player input to support keyboard, controller and touch, and optimization tips for C# for the best performance. We'll also show how to deploy to our devices and get your game up and running on Fire OS. You'll walk away knowing what it takes to publish to the Amazon Appstore and help expand your game's user base. We’ve analyzed the top mobile games to see what best practices make them stand out from the crowd. Several trends emerging now will amplify those best practices, and games will have more opportunity than ever to excel. In the future, the top games will have fully realized fan bases that will drive their user acquisition and engagement engines. That fan base will include players but also content creators, advocates and potential new customers — this will open up a wider range of monetization options. Hear more about how top mobile games drive greater engagement and revenue and learn how to you can do this with your own game. There are lots of suggestions about how to make a game fun. Best practices are everywhere, but you can't just follow them blindly. To create a fun game, you have to figure out how best practices integrate into your specific game. Watch what we did wrong, and what we learned along the way. 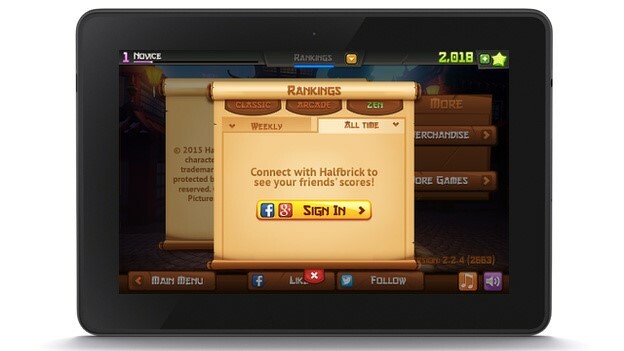 Free to play is now the standard for mobile and social games. But succeeding in free-to-play is not easy: You need in-depth data analytics to gain insight into your players so you can monetize your game. Learn how to leverage new features of AWS services such as Elastic MapReduce, Amazon S3, Kinesis, and Redshift to build an end-to-end analytics pipeline. Plus, we’ll show you how to easily integrate analytics with other AWS services in your game. This is a deep-dive straight into the guts of running a low-latency multiplayer game, such as a first-person shooter, on a global scale. We dive into architectures that enable you to split apart your back-end APIs from your game servers, and Auto Scale them independently. See how to run game servers in multiple AWS regions such as China and Frankfurt, and integrate them with your central game stack. We’ll even demo this in action, using AWS CloudFormation and Chef to deploy Unreal Engine game servers. Twitch is the largest live video platform and community for gamers with more than 100 million visitors per month. We want to connect gamers around the world by allowing them to broadcast, watch, and chat from everywhere they play. In this session, learn how game developers are creating engaging experiences and reaching new customers via the Twitch platform. Garnett Lee and Tyler Cooper hosted a steam during GDC this year on Twitch. 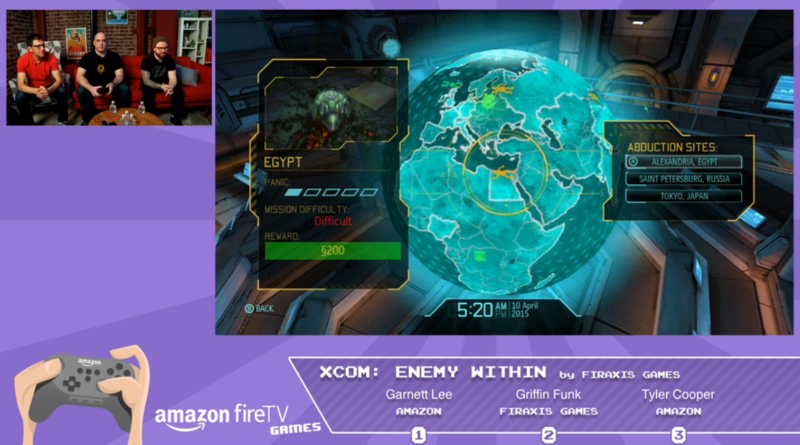 The guys were joined by representatives from 2K games for XCOM: Enemy Within, Tellate for Game of Thrones, Ep. 2, Tripwire for Killing Floor Calamity and ended the night with Hipster Whale and a Crossy Road competition! If you are a gamer interested in seeing first-hand what the current batch of Android games looks like on the big screen be sure check out the stream here. In 2012, the Application Developers Alliance set out to be a resource and an advocate for developers. Today, they've amassed a global network of more than 50,000 developers and more than 200 companies that care about them. 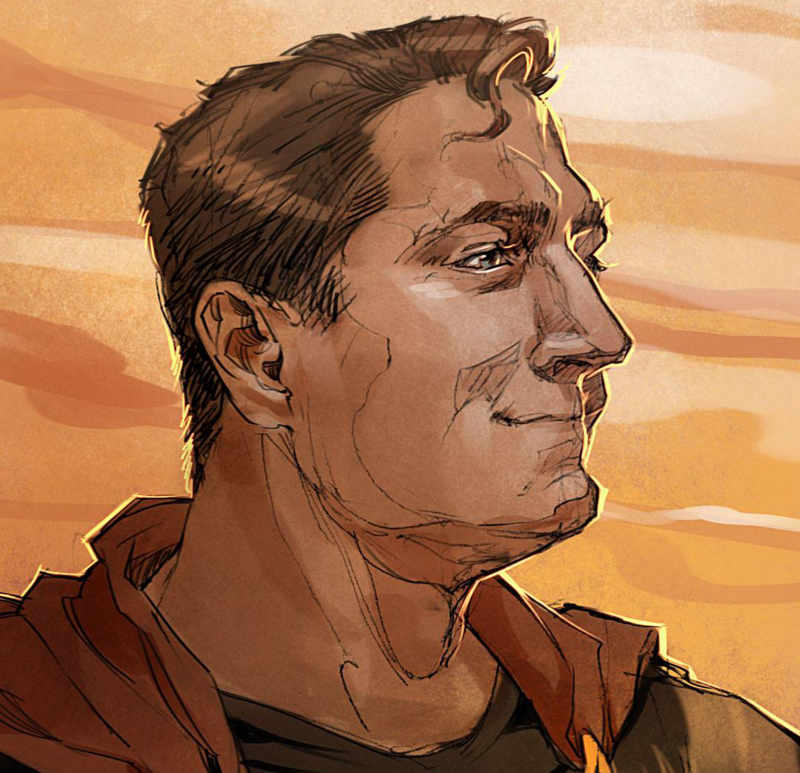 Their mission is to help developers of all kinds, everywhere. 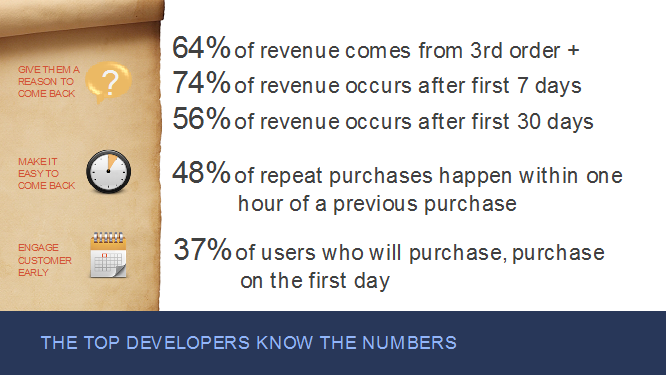 That's why they've launched their Global Developer Insights survey. In partnership with International Data Corporation (IDC), this survey will gather information from developers all over the world. Anybody who develops software (even just some of the time) can participate. With your help, the Application Developers Alliance will build a better understanding of the opportunities and pain points for the developer community. 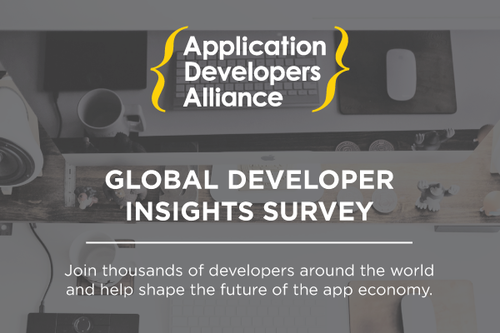 With this survey, the Application Developers Alliance want to learn more about the day-to-day responsibilities of developers, how a developer fits within their organization, the tools and services that power their work, and more about what it's like to be a developer. With this information, they'll be able to better inform new companies, technology partners, service providers, and you-the global developer community-about how to improve the app ecosystem. Most importantly, we at the Application Developers Alliance will be better able to serve you! The results will be compiled into a comprehensive Developer Insights report and distributed to members in May 2015. Amazon is hosting a Developer Day on April 25th at the Cross Campus in Santa Monica, California. 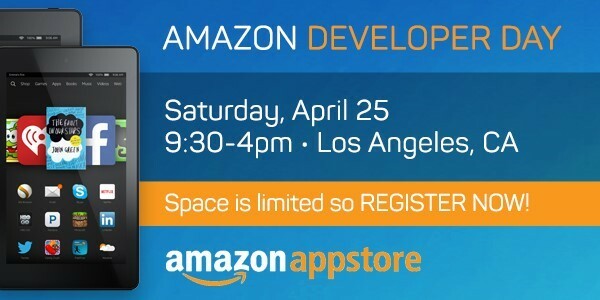 Amazon Developer Evangelists will share industry best practices and help mobile developers learn how to grow their app business via the Amazon Appstore. Amazon technology leaders will be on-hand to answer developer questions and lead talks on topics such as building apps and games for Android devices, BlackBerry, Fire tablets, Fire phone, Amazon Fire TV, and how to build voice controlled experiences for Amazon Echo. Attendees will also learn best practices around how to make fun games and to market your game to influencers and build a fan base. The format of the workshop will be split between morning lectures and afternoon “App Hours.” The App Hours will allow developers to get 1:1 support to publish and tests their own apps and games to the Amazon Appstore, guidance around building apps and games with Android, Unity and Xamarin, and hands on experience with the Amazon Mobile App SDK, Fire Phone SDK, Fire TV SDK and Amazon Echo SDK code samples. Developers will also be rewarded with Amazon gift cards for successful app submissions to the Amazon Appstore during the App Hours’ time period. Already have an Android app? Bring your APK for a chance to win cool prizes! Click here to register now! We will start the day off with an overview of Amazon's current developer ecosystem. Learn how you can take advantage of Amazon’s Mobile Apps SDK, Amazon's Appstore and the new line of consumer Fire devices like Amazon Fire TV, Fire TV Stick and Fire tablets, as well as monetization services such as in-app purchasing. Echo is a new device from Amazon designed around your voice. It's always on—just ask for information, music, news, weather, and more. Tucked under Echo's light ring is an array of seven microphones. When Echo detects the wake word, it lights up and streams audio to the cloud, where it leverages the power of Amazon Web Services to recognize and respond to your request. With the release of the developer SDK you can now build your own apps and experiences for Amazon Echo. This session will cover everything you need to know starting off with how to use the SDK, how to build your first app, and end with the app submission process. There are lots of suggestions about how to make a game fun. Best practices are everywhere, but you can't just follow them blindly. To create a fun game, you have to figure out how best practices integrate into your specific game. Come see what we did wrong, and what we learned along the way. We’ve analyzed the top mobile games to see what best practices make them stand out from the crowd. Several trends emerging now will amplify those best practices, and games will have more opportunity than ever to excel. In the future, the top games will have fully realized fan bases that will drive their user acquisition and engagement engines. That fan base will include players but also content creators, advocates and potential new customers — this will open up a wider range of monetization options. Come see how top mobile games drive more engagement and revenue and learn how to you can do this with your own game. Get 1:1 support to publish and test apps and games to the Amazon Appstore. Learn how to build apps and games with Android, Unity and Xamarin. Get hands on experience with the Amazon Mobile App SDK, Fire Phone SDK, Fire TV SDK and Amazon Echo SDK code samples. Seating is limited so be sure to register for the event to reserve your spot. Hope to see you there! The Amazon Mobile Ad Network increases monetization opportunities with the addition of the modeless interstitial ad format and the ability to serve ads to users in Japan. 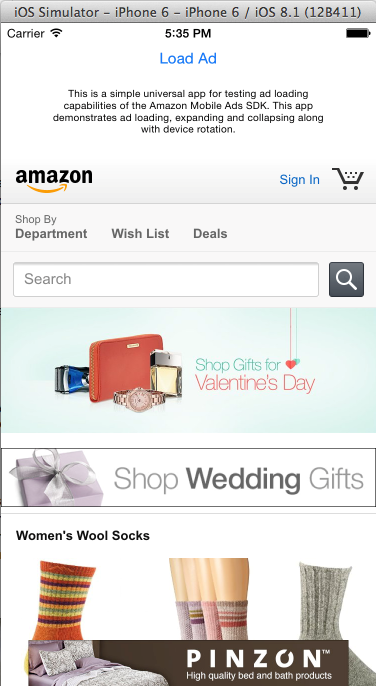 Amazon modeless interstitial ads are full screen ads. Unlike currently served interstitial ads, which appear during app transitions (in between game levels) and require users to close the ad, modeless interstitial ads appear as app content between content screens to maintain the app’s native experience for the user and do not require users to close the ad. You can customize modeless interstitial ads with content matching frames or transparent backgrounds. The seamless delivery of modeless interstitial ads can increase your user engagement and number of ads served. You can earn more money from your apps and games now that the Amazon Mobile Ad Network is available to serve ads to your end users in Japan. The Amazon Mobile Ad Network lets you place high-quality display ads in your app, helping you gain access to relevant ads from brand advertisers, including Amazon and its subsidiaries. Monetize across supported countries (US, UK, Germany, France, Spain, Italy, and now Japan), devices (iOS, Android, and Fire OS tablets and phones), and app stores (Amazon Appstore, Apple App Store, and Google Play). The Amazon Mobile Ad Network gives you the opportunity to earn more and pays you on ad impressions served. New to the Amazon Mobile Ads API: Download the Amazon Mobile App SDK and integrate the latest version of the Amazon Mobile Ads API. Refer to the Android and iOS quick start guides for implementation details. Enabling Modeless Interstitial Ads: To enable modeless interstitial ads, recompile with the latest version of the Amazon Mobile Ads API. Modeless interstitial ads require a separate ad call. Refer to the Android and iOS quick start guides for implementation details. Serving Ads to Users in Japan: If your app or game already uses Android v5.1.236 (or later) or iOS v2.0.3 (or later) of the Amazon Mobile Ads API, you are all set for serving ads to users in Japan. 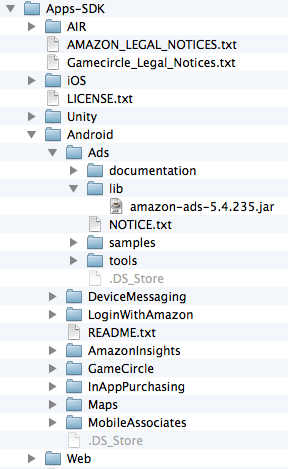 If you are currently using an older version of the Amazon Mobile Ads API, simply recompile with the latest version. Ad requests you send will automatically be filled for the US, UK, Germany, France, Spain, Italy, or Japan as appropriate. Learn more about the Amazon Mobile Ads API on our Developer Portal here as well as through our blog post on tracking ad events inside your apps. 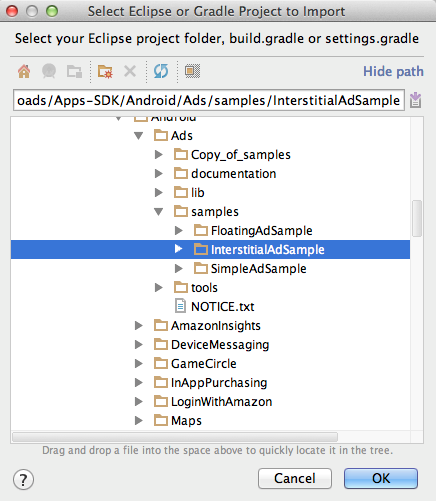 I recently published a blog post about how you get started using the Amazon Mobile Ads API in your Android Java based app or game. 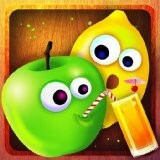 This blog is about how you do the same with an iOS app or game. What Is the Amazon Mobile Ads API? 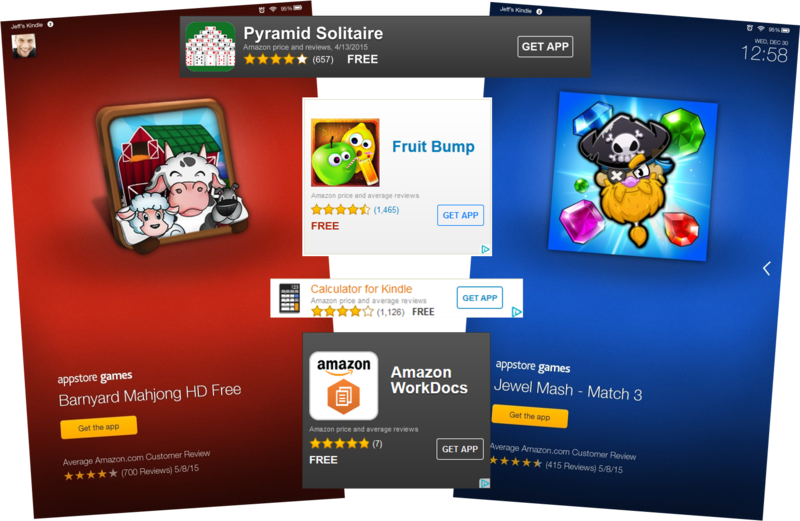 The Amazon Mobile Ads API allows you to monetize apps and games across the Android, Fire OS, and iOS platforms by displaying ads to customers in the US, UK, France, Italy, Spain, and Germany. Ads can be banner or interstitial and will advertise products or services coming from Amazon or other well-known brands. You are paid on ad impressions served whilst some other Ad networks only pay on clicks. To get more information on the benefits of using the Amazon Mobile Ad Network, check out the Success Stories. 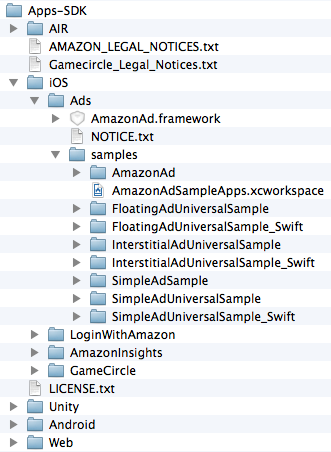 The Amazon Mobile Ads API requires iOS 6.0 or above and Xcode 5.1.1 or above. The API is part of a single SDK (the Amazon Mobile App SDK, which you can download here) that also provides access to other Amazon mobile services and APIs such as GameCircle and In-App Purchasing. The same download also includes the necessary files to use the API in apps developed for Android. Before you can use the Amazon Mobile Ads API in an app, you should create an Application Key that is unique to the application. This key is used by the Amazon framework to identify your app so it’s essential that you use the correct one so that you will be paid. Note that if you have Android and iOS variants of the same app they must use different application keys. To create a new key you need an Amazon Apps & Games Developer Portal account. If you don’t have one, you can create an account by visiting here. Also note, because you will be receiving income into the account, you will need to add your payment and tax information details to your developer account profile. You can bypass this step for now if you want to just try out the API using one of the sample apps. Just make sure you create your own key (and account) later. 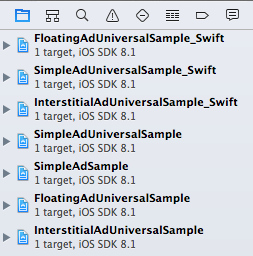 Building the iOS samples in Xcode is pretty straightforward. You can import the samples as individual projects into your workspace or you can just get them all in one go by importing the workspace file (.xcworkspace extension) that is in the iOS samples root folder. Using the Amazon Mobile Ads API in your own code is relatively straightforward and this Quick Start Guide goes through the steps that you need to follow. The following sections provide some additional tips on using the APIs. At a minimum you usually need to add the Mobile Ads framework AmazonAd.framework and you may need to add any of the frameworks that are listed in the section “Incorporate the API into your project” in the Quick Start Guide if they are not referenced by your project. 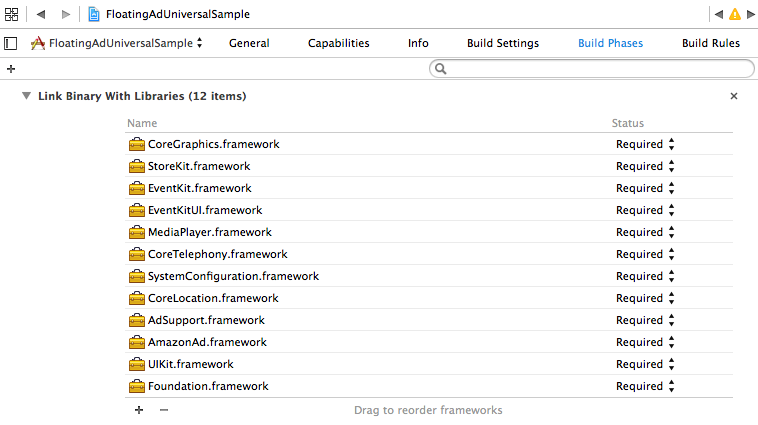 Note that you add frameworks to Swift and Objective-C projects in the same way in Xcode. The Quick Start Guide does not at the time of writing discuss the Swift version of the APIs so I thought it would be useful if I provided a quick overview in the sections below. Where: you substitute ‘123’ with the real application key in the production version of the app. To create a banner Ad, your app must create an instance of the AmazonAdView class in the applicable UIViewController class and then load the Ad using the loadAd() method from the AmazonAdView class. The Ad is then loaded in a separate thread (created by the framework) that will report its status via callbacks in the delegate AmazonAdViewDelegate. The abbreviated code snippet below shows the main activities that need to be done in the app’s applicable UIViewController instance. For simplicity, I have hard-coded the banner size as 320 by 50 pixels in the snippet above but normally you set the Ad size using constants in the AmazonAdOptions class according to whether the app is running on an iPhone or iPad. See Mobile Ads iOS API Concepts for more details. It is essential that during development you set the isTestRequest member of the AmazonAdOptions instance (used when loading the Ad) to true. In the production version you must set it to false. To create an interstitial Ad again you create an instance of the AmazonAdInterstitial class in the applicable UIViewController instance and then load the Ad using the load() method from the AmazonAdInterstitial class. The Ad is loaded in a separate thread that will then report its status via callbacks in the delegate AmazonAdInterstitialDelegate. The abbreviated code snippet below shows the main activities that need to be done in the app’s applicable UIViewController instance to load an interstitial Ad. During development, it’s a good idea to enable logging using the associated methods in the AmazonAdRegistration class. Doing so makes it easier for you to track the messages sent to the ad framework in Xcode. Just make sure to disable logging before launching your app to production. As per the Android version of the API, the Amazon Mobile Ads API enables you to hook into several events related to a banner Ad. For example, you can hook into an event that indicates that the Ad failed to load and in that case you could could determine the possible cause of the failure and if applicable choose to fill the advert using an alternative ad network. This callback function must be implemented and it tells the AmazonAdView class which view controller class it should use to render the Ad and also to report events. Implement this callback if you want to do something when the Ad was successfully loaded. Implement this callback if you want to so something when an Ad failed to load successfully. You would typically determine the likely cause of the error using the error code and respond accordingly. Implement this callback if you want to know when the user has tapped the Ad and it is to be displayed modally. Implement this callback if you want to know then the user has closed down an Ad that was displayed modally. Implement this callback if you want to do something after the interstitial Ad has loaded successfully. Implement this callback if you want to do something when the interstitial Ad has failed to load. Typically you would process the error code and act accordingly. 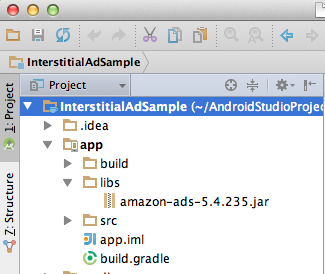 Implement these callbacks if you want to do something just before or after the interstitial Ad is displayed. Implement these callbacks if you want to do something just before or after the interstitial Ad is removed from the display. It’s worth checking out this article about event tracking and error handling. It describes how you hook into the events in Objective-C code but it’s also still very relevant for apps that have been written using Swift. Also, it’s worth stepping through the sample code so that you are clear on when the events are received. 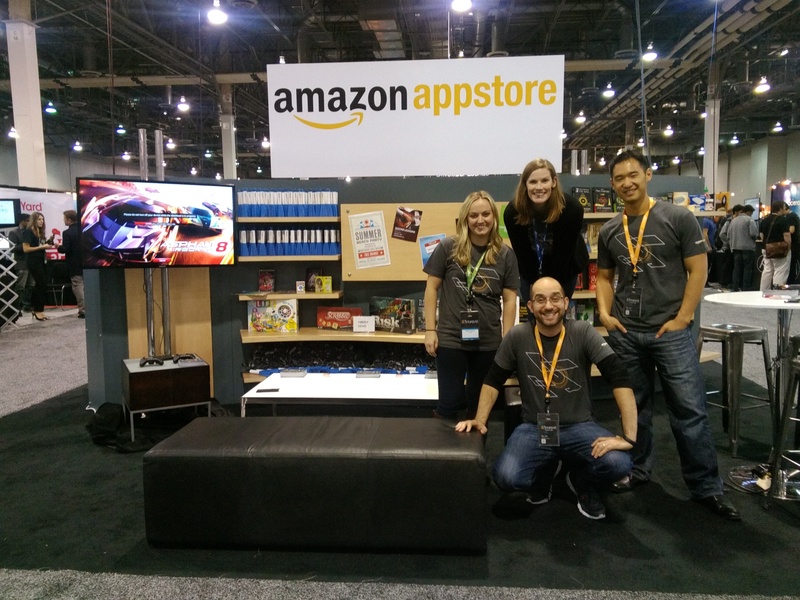 It’s easy to integrate the Amazon Mobile Ads API into your iOS app or game. Doing so provides you with additional ways in which you can monetize via ads relating to products or services that come from Amazon or other well-known brands. Once you have integrated the API, you are paid for ads on impressions rather than on clicks. That’s it for now. In my upcoming blogs I will discuss how you can use the Amazon Mobile Ads API in games or apps created using various frameworks, as well as provide guidelines on Ad mediation and best practices when including Mobile Ads in your app or game. 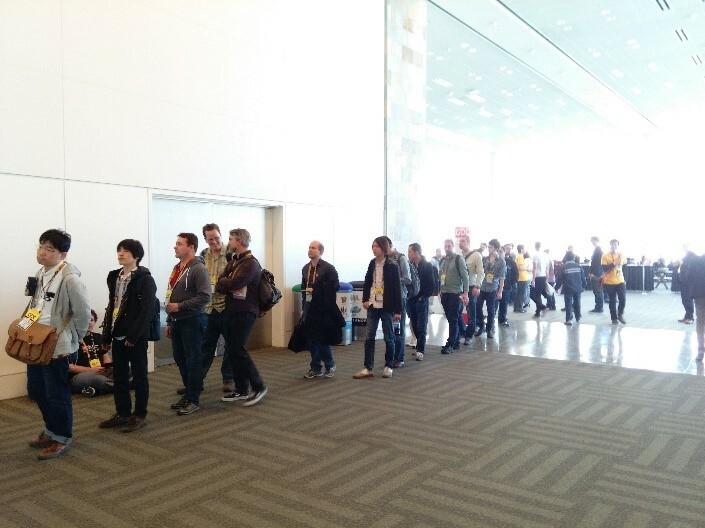 Amazon will be out at GDC San Francisco next month offering several opportunities to connect directly with you. Starting on Monday, March 2nd from 5:05pm to 5:30pm you can hear @MikeFHines talk about What Makes the Top 50 IAP Games Unique on the Amazon Appstore and lessons you can apply when generating revenue in your own games. Then on Tuesday, March 3rd from 10am to 5:30pm we will be hosting an Amazon Developer Day covering games for Amazon Fire devices, how to build better cloud gaming experiences, reaching fans with Twitch, and applying in-app monetization best practices based on Amazon's IAP data. Technical evangelists from Amazon Appstore and AWS will be on hand to answer your questions as well as the Games Business Development team to discuss game promotion opportunities. We’ll also have devices for you to explore and test your games on, as well as a chance to win some Amazon Fire devices! Here is what the day’s agenda will look like. Click here to add a session to your GDC Scheduler. We will start the day off with an overview of Amazon's current developer ecosystem. Learn how you can take advantage of AWS services specifically targeted for Game Developers, Amazon's Appstore and the new line of consumer Fire devices like Amazon Fire TV, Fire TV Stick and Fire tablets, as well as monetization services such as in-app purchasing. Plus, hear how G5 entertainment has had success on the Amazon platform from G5 CEO Vlad Suglobov. In this talk, we'll cover important tips for porting Unity games over to Fire TV, Fire tablets and Fire phone. Through code examples, we'll demo how to support multiple resolutions for pixel perfect Orthographic and Perspective Cameras, abstracting player input to support keyboard, controller and touch, and optimization tips for C# for the best performance. We'll also show how to deploy to our devices and get your game up and running on Fire OS. You'll walk away knowing what it takes to publish to the Amazon Appstore and help expand your game's user base. Twitch is the largest live video platform and community for gamers with more than 100 million visitors per month. We want to connect gamers around the world by allowing them to broadcast, watch, and chat from everywhere they play. In this session, learn game developers are creating engaging experiences and reaching new customers via the Twitch platform. 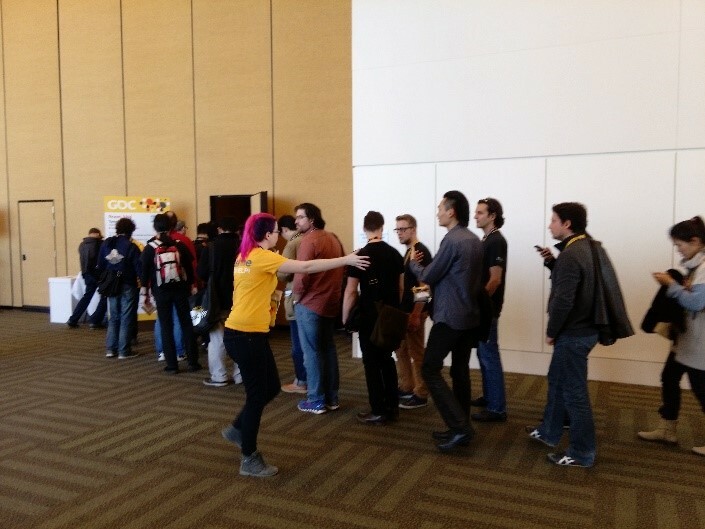 The Mobile Ads Team will be at GDC and has created a special offer just for attendees! While attending GDC anyone who integrates the Amazon Mobile Ads API for the first time into their app or game will receive a $100 Amazon.com Gift Card. * The Amazon Mobile Ads API is easy to integrate and delivers highly-relevant mobile optimized ads from Amazon and brand advertisers ensuring a great experience for users. Members of the Mobile Ads team will also be on hand in booth #2429 to help you throughout the event. Then on Wednesday, March 4th we will be broadcasting live from GDC with a couple of special guests from 4pm to 7pm. The event is open to the public from 4pm to 6pm and you do not need to be a GDC pass holder to attend. Simply stop by the AWS Pop-up Loft on Market Street between 4pm to 6pm PST and join us in person for the Twitch stream. We will be showcasing several new Amazon Fire TV games as well as interviewing the game developers who created them. Not at GDC? No worries, you will be able to watch the stream live on Twitch here from 4pm to 7pm PST. If you’re a gamedev at GDC this will be a great opportunity for you to speak directly with Amazon Appstore, AWS and Twitch experts all in one place. Hope to see you there! *Visit exhibit #2429 for more details. Send us an email at amazon-mobile-ads@amazon.com with your Amazon Developer Portal registered email ID to qualify. 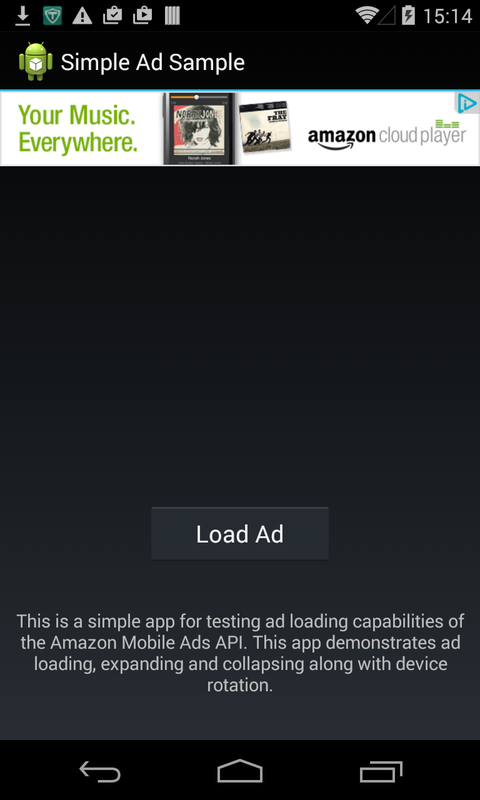 Existing apps already sending ad requests do not qualify. Existing developers who integrate the Amazon Mobile Ads API into another qualified app for the first time are eligible for the offer. One Amazon.com Gift Card per participant while supplies last. Amazon.com Gift Cards ("GCs") may only be redeemed towards the purchase of eligible products on www.amazon.com GCs cannot be reloaded, resold, transferred for value, redeemed for cash or applied to any other account. Amazon.co.uk is not responsible if a GC is lost, stolen, destroyed or used without permission. See www.amazon.com/gc-legal for complete terms and conditions. GCs are issued by ACI Gift Cards, Inc. All Amazon ®, ™ & © are IP of Amazon.com, Inc. or its affiliates. Amazon may modify or cancel this offer at any time. In the previous article in this series, we wrapped up our study of what the top 50 apps do with IAP that the rest of us don’t. Over the last 10 weeks, we delivered a significant amount of data and suggestions, and it can be a bit daunting to figure out where to start. This week we’ll give you some ideas on where to get started by highlighting the top 3 practices that might make the biggest difference in your game. Use your favorite analytics package and learn about how your customers play and buy within your app. It’s our experience that 80% of an average game’s downloads won’t be active after 7 days, and that 3% of downloads from the Amazon Appstore turn into paying customers. 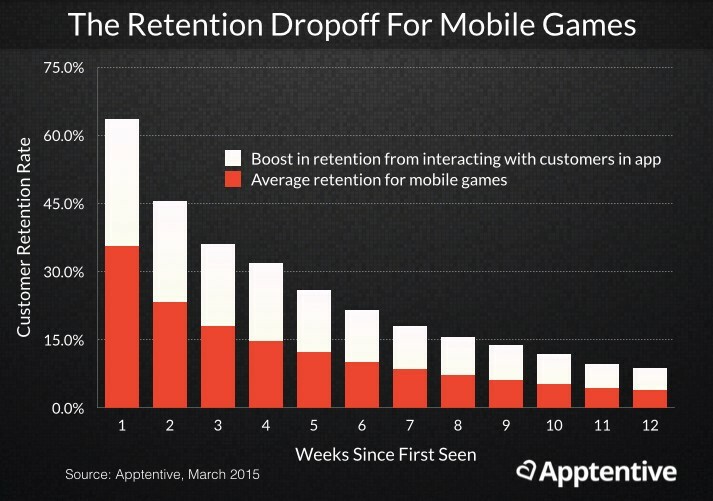 And it’s those customers who stay with you over one week that will drive 74% of your total game revenue. This exclusive group of customers is your loyal following. Treat them like gold! If you’re showing your best 30 day + customers the same IAP catalog that you showed them on day 1, you’re likely leaving demand unfulfilled, and you’re probably not making the best use of IAP. When creating new IAP items for your good customers, do NOT just add these items to the same IAP catalog you show your first day users! You want to keep the catalog clear and un-cluttered for beginners, as well as offer the enticement of a catalog that changes for your veteran players. To fine tune what items work best in each IAP catalog, find an A|B Testing API that you can use to get real-world data on each IAP catalog. Create a new instance of your IAP dialog box that can you can show to your best customers. If your IAP catalog doesn’t have a benefit (like BONUS % in this catalog), you may not be making the reason to buy clear enough for your customers. If you’re selling a sword instead of coins, the customer will want to know how much more damage it will do, or what villains it will decimate as opposed to those enemies that their current sword won’t scratch. Make the benefit clear, and you’ll make more sales and have happier customers. 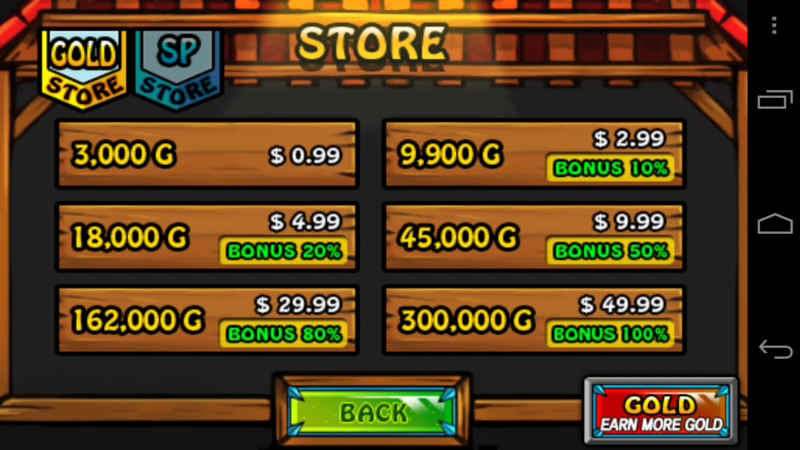 Look at your existing IAP items and of each item ask: Why would a player want to buy this? I hope you’ve enjoyed this series, and are starting to see improvement in your IAP monetization as a result. For more insights on how to keep users engaged and boost revenue check out our free eBook, “In-App Purchasing Lessons from the Top 50 Game Developers”. In the mean time, I’d love to be working on the next subject you’d like to learn more about or see data about. Let me know, and ping me on Twitter @MikeFHines. Part 10: The Top 50 Don't Guess. They Know. In the previous article in this series, we looked at how lowering barriers to new app sessions paves the way for more sessions, and more minutes in the app per day. We also looked at how tuning the difficulty for a game can make a significant impact in user engagement, retention, and IAP conversion. This week we’ll see how the top 50 see what to change, and how they implement change. To address the right offers and messages to your customers, to know where you may have a retention issue, and to know other key metrics about your app, you need to be able to see inside, and see how your users interact with your app. App analytics packages are services put together by quite a variety of providers, and are a great way to get started with the basics, as well as progress up through full custom instrumentation. To help scope an analytics implementation project or provider decision, you should start with knowing what you need to know to make smarter decisions. (like how long has this user had the app? How many purchases has this user made? 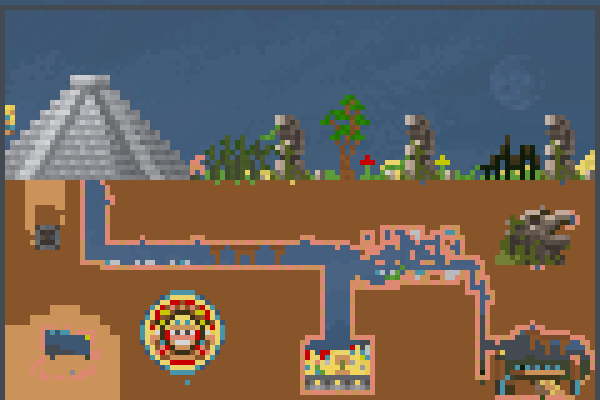 How long did it take this user to complete the last task/level/milestone?) If you’re not going to use a metric to influence your actions, think twice about how much you really need to implement that metric. 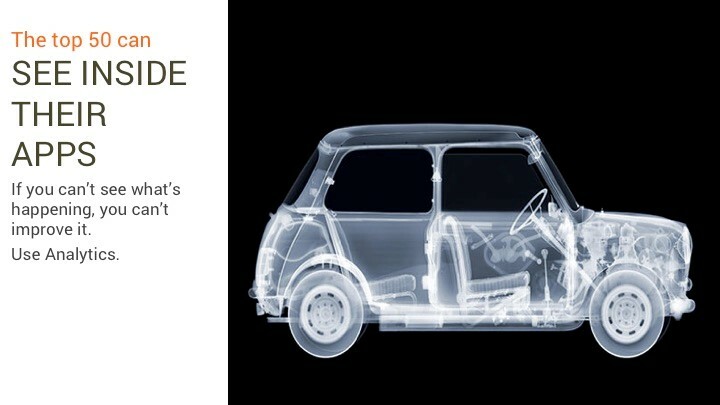 Seeing inside your apps is critical, but it doesn’t do anything. Being able to do something about what you see is how your app starts performing better. In order to optimize your apps, you’ll need to have a lot of levers in you app that you can manipulate to change the behavior of your app (like difficulty). 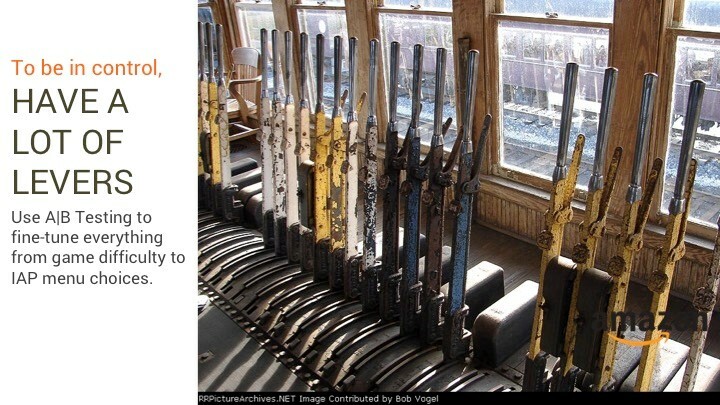 These levers come in the form of A|B testing. A|B Testing lets you find out if you should make your game easier or harder, and how much more so to make it to meet your goals. A|B Testing tells you which items are the most popular or profitable for you to offer your day 1, day 7, or day 30 users. While I’m partial to the Amazon A|B Testing service because of it’s flexibility, ease of implementation, and price, you can get A|B Testing services from several vendors. Remember, the top 50 don’t guess. They know. That’s it for the series What the Top 50 Games do with In App Purchasing that the Rest of Us Don’t. For more insights on how to keep users engaged and boost revenue check out our free eBook, “In-App Purchasing Lessons from the Top 50 Game Developers”. 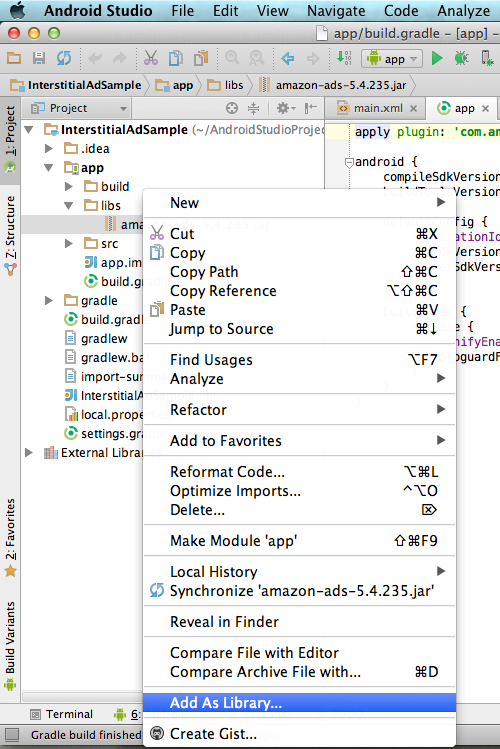 This blog is about how you get started with using the Amazon Mobile Ads API in your Android Java based app or game that is running on an Android device, Amazon Fire OS tablet or phone device. The Amazon Mobile Ads API is part of a single SDK (the Amazon Mobile App SDK, which you can download here) that also provides access to other Amazon mobile services and APIs such as GameCircle and In-App Purchasing. 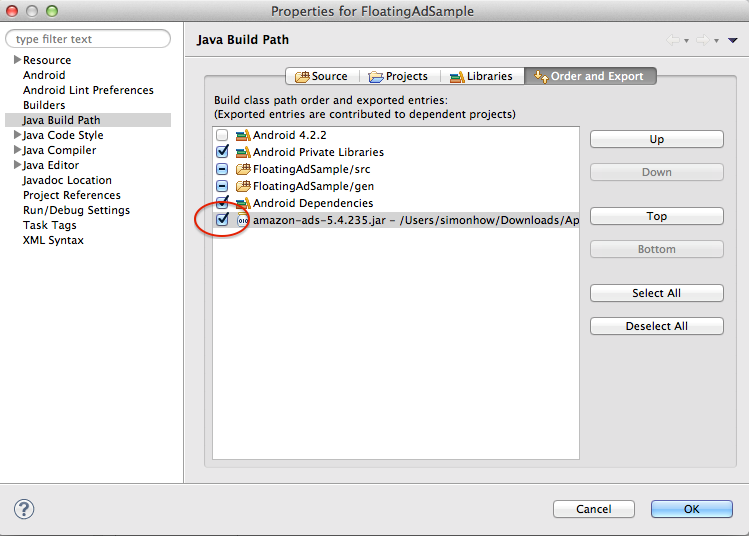 The same download also includes the necessary files to use the Amazon Mobile Ads API in apps developed for iOS. Before you can use the Amazon Mobile Ads API in an app, you should create an Application Key that is unique to the application. This key is used by the Amazon framework to identify your app so it’s essential that you use the correct one so that you will be paid. To create a new key you need an Amazon Apps & Games Developer Portal account. If you don’t have one, you can create a free account by clicking here. Also note, because you will be receiving income into the account, you will need to add your payment and tax information details to your developer account profile. This step is quite easy to miss and unfortunately, if you don’t complete the step, the project will still build successfully but you will get runtime errors saying that methods in the API cannot be found! Using the Amazon Mobile Ads APIs in your own code is relatively straightforward and this Quick Start Guide goes through the steps that you need to follow. There are, however, a few things that are worth delving into a little deeper which I discuss below. To use the APIs, you need to add a least one permission to the project’s manifest file. 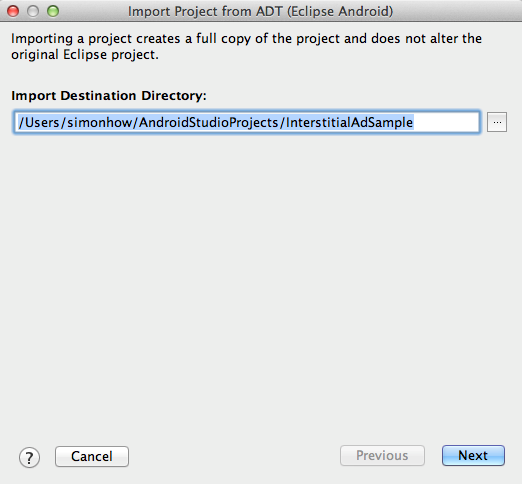 You have to add the permission android.permission.INTERNET as this enables the app to communicate with the ad server. Additionally, it is advisable to add the other permissions suggested in the Quick Start Guide as doing so will give the ad framework a better chance of delivering ads that are more relevant to the user - see also section “Loading the ad” below. In the snippet above, the code uses the Mobile Ads API to send the position of the device to the Amazon Mobile Ad Network so that potentially more targeted ads are delivered to the host app. Note that the user may still choose to disable this feature by disabling location awareness on a system level in the device settings. During development, it’s a good idea to enable logging and testing using the associated methods in the AdRegistration class. Doing so will for example make it easier for you to track the messages sent to the ad framework in the logcat window. Just make sure to disable logging and testing before launching your app to production. Once an Ad object has been created, it’s possible to hook into events that are generated by the API. This is done via a special listener class from the Mobile Ads API called DefaultAdListener. When you do this, you can trap several events related to an ad and these result in calls to methods that you override. For example, the onAdFailedToLoad() method is called when the ad has failed to load and in that scenario you could determine the possible cause of the failure and if applicable choose to fill the advert using an alternative ad network. See this article about event tracking and error handling for more details. The Amazon Mobile Ads API provides you with additional ways in which you can monetize your mobile apps and games via ads relating to products or services that come from Amazon or other well-known brands. 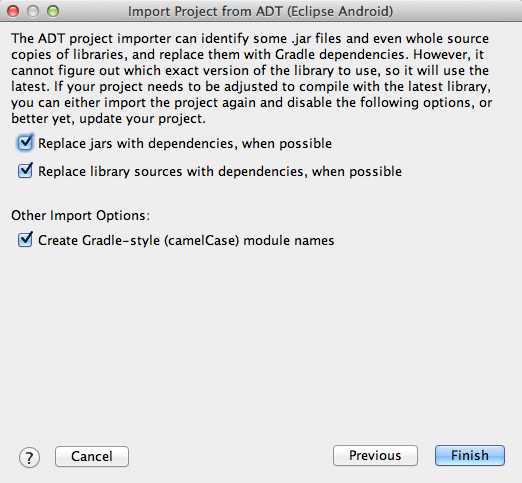 Integrating the API into your Android Java app or game is quick and easy. Once you have integrated the API, you are paid for ads on impressions rather than on clicks. In upcoming blogs, I will discuss how you can use the Amazon Mobile Ad API in games or apps running on iOS and those that have been developed using popular frameworks such as Unity and Marmalade.